What’s the best solution for your Business Bookkeeping needs? All of the solutions listed below include: The use of the latest QuickBooks Cloud programs at no extra charge . Setup and necessary training. Automatic downloading and storage of bank account and credit card transactions to the QuickBooks Cloud program. Transparency – You and I work on the same books. We see what each other has done. Virtual Cloud document management. A secure portal to download and upload documents. No need to fax, e-mail, or mail. Ongoing oversight and monitoring. Adjustments and journal entries to your books as needed. Closing and balancing your books at year-end. Help with Nevada state tax returns and reports. Reminders of when filings are due. Unlimited phone and e-mail support during business hours. My business hours are 7 am to 7 pm Monday through Saturday. Solution One: Self Employed – Sole Proprietorship This bookkeeping solution is ideal for a one owner business that keeps his or her books on a cash basis. Does not carry inventory. Does not need accounts receivable. Does not need a balance sheet. It provides an easy way to track income and expenses so the information needed to file a 1040 schedule C (Profit or Loss from Business )that is ready at tax time. The types of businesses using this solution are service businesses such as Home or Lawn Maintenance, Tradesmen, Photographers, Home Inspectors, Uber or Lift Drivers, Truckers, or anyone who goes from one client or one place to another to offer services. The books will be kept on an Intuit QuickBooks Cloud program that you can run on a computer, tablet, or smart phone. I have clients that do everything on a smart phone. One of the great features of this system is that there is a GPS mileage tracker app that helps you keep the IRS required mileage logs so you can deduct auto expenses. Intuit also offers credit card processing and provides a free card reader for your smart phone. As my client, I can get you lower fees on processing credit or debit cards and no charge for ACH bank transfers. You can generate basic invoices right from your smart phone and e-mail them to your customer. If you have the credit card processing from Intuit, your customer can pay the invoice on line. The price for this solution is $60.00 per month. Solution Two: Essential Business Best suited for a small business who wants to keep their books on a cash or accrual basis. It allows for accounts payable (bill tracking) and accounts receivable (sales tracking). Lets you customize invoices. Provides full general ledger accounting, and fixed asset accounting, including depreciation schedules. You will have on demand access to your financial statements, Profit or Loss and a Balance Sheet. The price for this solution is $80.00 per month. Includes a $30.00 retail value QuickBooks Cloud based program. Solution Three: Complete Business Includes all items in solution two (Essential Business) plus the ability to create and send purchase orders. Track inventory. Prepare and print 1099’s for sub contractors. Create and print estimates. Give employees limited access to enter time worked. Track billable hours by customer. Create budgets to estimate income and expenses. Categorize income and expenses using class tracking. Track sales and profits for each location. Limit the number of users having access to QuickBooks. The price for this solution is $90.00 per month. 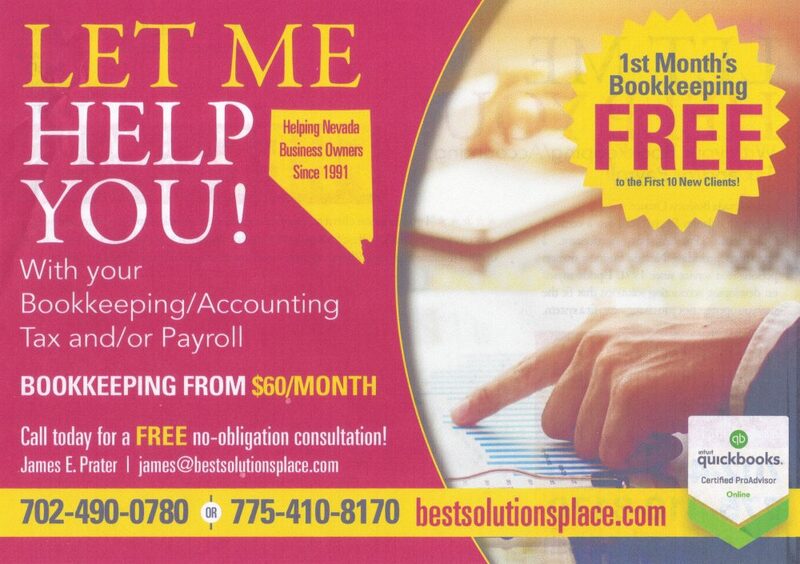 Includes a $40.00 retail value QuickBooks Cloud based program. The Final Solution: WHAT EVER IT TAKES! I will work with you to design a non-traditional bookkeeping system tailored to your needs, desires, and abilities. Cost is based on negotiations.